I’m getting married, and the wedding is getting close. Is there a quick way to fix my teeth? They’re a little splotchy and just a very little crooked, and I want to look my best for my big day. If time is a big factor, you may not want to deal with porcelain veneers. Porcelain veneers can look beautiful, but they can involve a one- to three-week wait for the laboratory work, and if they’re not quite right when they come back from the lab, each trip back could be another one to three weeks. Direct tooth bonding, however, is a one-appointment procedure. And if the bonding looks good but not perfect, you can leave it on the teeth and fix it later, which you can’t do with porcelain veneers. The caveat is that you absolutely need an artist for a dentist, because all the work is done chairside and freehand by the dentist. There are even some excellent cosmetic dentists who shy away from direct tooth bonding because they can’t deliver the level of quality they want. 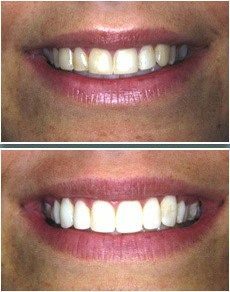 Below is a photograph of a wedding cosmetic dentistry case. 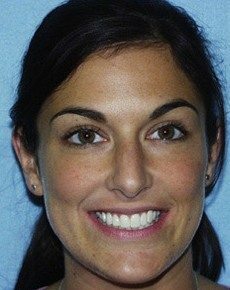 Kelly wanted a beautiful smile for her wedding day, and she got it from Dr. Peter Ciampi, our recommended cosmetic dentist in Monmouth County, New Jersey. She said that she felt like smiling so much at her wedding that her cheeks hurt afterward! For more information about Dr. Ciampi, click here. Another option would be a Snap-on-smile, which does take two appointments but is a temporary smile makeover. It won’t give you a fabulous smile, but it can give you an acceptable smile if your teeth are unsightly. Click here to go back to the frequent questions about cosmetic dentistry page. Click here is you have a question you’d like to ask Dr. Hall. He answers by email. Can I have cosmetic dentisry while I'm pregnant?